The typical U.S. family has a deck of cards and a few games in the closet. Most have heard of few, if any, of the best family games to come out in recent years. This is too bad, because quite a few of these games are far more fun and interesting than just about every game invented before 1995. This article profiles 5 modern strategy games that are terrific for the whole family, including ours. All 5 of these games have received many positive reviews on general retail sites such as Amazon as well as the top game enthusiast site, boardgamegeek.com. All of these games have been around for over 5 years, yet continue to grow in popularity. All of these games work well for 2, 3, or 4 players, and two of them work well for 5 players. All of these games have been played and enjoyed frequently by our family of 3. In this article I discuss what all great family strategy games have in common. I then briefly describe each game and why it’s so well liked, providing a link to an in-depth review if I wrote one. I also discuss why certain games barely miss the cut, and why others, such as Monopoly, don’t even come close. And for those of you who have a question or disagree with something I said? Leave a comment! Strategy games are games that require thought and pattern recognition to make good decisions. As Wikipedia says, almost all strategy games require internal decision tree style thinking, and typically very high situational awareness. There are many great strategy games, some of which have existed for centuries. However, many great strategy games are not suitable for the whole family. When a family gets together for a game, it’s often going to be 3 or 4 players, so 2-player games like Go, Chess, and Reversi don’t work. Even if they weren’t just 2-player games, Go and Chess in particular have a long learning curve and are therefore not appealing to a wide variety of personalities and ages. Though there are many complex strategy games that can be played with 4 players (such as Bridge, my favorite card game), many are not suitable for young kids or people who don’t want to invest a great deal of time or effort in order to begin to enjoy a game. Above all, it needs to be fun for everyone! If you’re already an enthusiastic gamer who knows the lingo, you may have heard of the phrase “gateway game.” A gateway game is easy to learn and so fun that it gets people interested in playing board games in general, possibly leading to more complex and interesting games over time. The definition of a gateway game heavily overlaps with the list I just presented. So it’s no accident that the 5 games I recommend are all thought of by the gaming community as gateway games. These games are not as serious as Go, Chess, or the card game of Bridge. Yet they all have some strategy to them, more than many people realize at first. They can all be enjoyed by a new player very quickly, and they all appeal to a wide variety of ages and styles of gamers. Now that you understand what makes for a great family strategy game, let’s get to the games! In Catan, players compete to see who can settle an island most efficiently. Hexagonal tiles produce resources needed to build roads, settlements, and cities. You place settlements and cities at the edges of tiles and then hope for good rolls of the dice to acquire these resources. However, through trading, diplomacy, development cards, playing the laws of probability, and efficiently growing your network of roads, settlements, and cities, you can greatly reduce luck and cleverly maneuver your way to victory. This game, formerly called Settlers of Catan, was the German strategy game that ushered in a new wave of board game creativity in the United States (German version 1995, U.S. version 1996). Other good German games existed before this one, but for whatever reason this one caught on big in the U.S. and paved the way for a new era of “Euro” games. These strategy games have relatively simple rules, abstract but attractive game components, indirect player interaction, and short to medium playing times. What keeps gamers playing Catan 25 years later? There are many competing Euro games these days, but I have yet to play one that has such fun trading rules. Also, there are several ways to slow the leader, the most important being the “robber” which stops all production of a “robbed” resource hex when moved there. The game is thus highly interactive, keeping everyone engaged at all times. Yet another nice feature is that it plays reasonably well with 5 players. One drawback is that it’s not much fun with 2 players with the standard rules. After much experimentation, my wife and I figured out a variation that works well for two players. I documented our two-player variant of Catan at the Board and Card Games part of Stack Exchange. The manufacturer suggests an age range for Catan of 10+. Our son played much earlier, a couple years before he could read. At first we played without development cards, but then we introduced them and he simply memorized what they all did from the pictures. This game can easily be played by 7-year-olds and even younger for the kid who really loves games. Catan takes 60-90 minutes to play. I have not yet posted a Catan review, but I can tell you this: I have played more hours of Catan than the other four featured games combined. We still occasionally play it, nearly 20 years after we first acquired the game. Dominion is a “deck building” card game. Each player starts with a deck of 10 weak cards, attempting to improve it throughout the game by purchasing and playing Action, Treasure, and Victory cards. Each game starts differently because only 10 of the Kingdom cards (mostly Action cards) are used with each game. The game ends when the most valuable Victory card pile runs out, or any 3 other card piles run out. The winner is the player who accumulates the most points worth of Victory cards. If you want to learn more, I wrote an extensive review of Dominion, which includes a lengthy strategy discussion. This game has far more strategy than is readily apparent to someone new to the game. Dominion is widely regarded as more complex and strategic than the other 4 games profiled in this article, and is played by some gamers very seriously. In fact, it is not even recommended as a family game at boardgamegeek.com, but rather a strategy game. However, many families, including several I know, enjoy this game without taking it too seriously or knowing much about strategy. They just have fun buying Kingdom cards that seem interesting and see how it works out. I played a couple of 5-player games of Dominion for the first time recently, using the 5-player rules from Dominion-Intrigue. Long waits between turns were not fun. However, it is an excellent game for 2, 3, or 4 players. It typically takes 30 minutes to play after you’ve played your first few games, though occasionally it can run longer with certain card combinations. It’s rare to find a game that is very strategic, takes 30 minutes to play, and is fun to play for 2-4 players of mixed ability. Dominion is arguably the best such game. 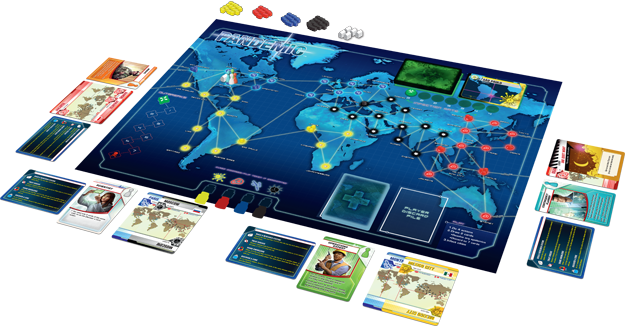 In this cooperative game, players work together to try to stop 4 diseases from rapidly spreading before they destroy all human life on Earth. Each player plays a different role: Scientist, Researcher, Medic, Operations Expert or Dispatcher (and in latest edition, also Contingency Planner or Quarantine Specialist). Players frequently discuss with each other how to collaborate to prevent the end of human civilization, by rapidly mobilizing to cities where the outbreaks are worst. Part of what makes this game so great is that the mechanism for randomly and rapidly seeding and spreading disease creates tension and drama that manages to come out differently each game. The first few times you play the game you lose, and it’s by no means easy to win for even experienced players when playing at the most difficult level, using 6 epidemic cards. If players stop discussing and cooperating, the human race is doomed. Though the suggested age on the box is 13+, the rules are simple. I think the reason for the high age is the theme. My son had no problems playing this game at the age of 8, but suitability of this world-ending theme will vary by personality. My son often asks to play this game when he’s sick or shortly thereafter. This game plays best with 3 or 4 players. It can be played with 2, but it’s not as fun to have only 2 roles in play that keep repeating the same 2 abilities. Playing time varies depending on the setup. With a really unlucky setup it’s possible to lose in less than 15 minutes, but a more typical game takes 30-60 minutes. Most cooperative games I’ve tried are boring. Not Pandemic. It has an exciting theme that is very well done and lends itself well to cooperation. That, combined with mechanics that create ever escalating tension and drama, makes this a great game. Stone Age is another game that has a great theme. Players gather resources to grow population, build tools and buildings, and acquire cards needed to build civilization. They do this by taking turns placing their people on board regions such as forests, hunting grounds, or agricultural fields and then performing the appropriate action with each person in each region, in any order. At the end of each turn, people must be fed to avoid suffering. Those who best adapt to other players’ actions and the ordering of huts and cards with efficient use of people and resources stand the best chance of winning. Terrific components, beautiful artwork, and simple rules help players get into the spirit of guiding a stone age tribe. If you don’t feed your people, they starve! The first few times you play this game, you may end up with the impression that strategy is limited, requiring only a few games to master. After everyone has mastered these simple strategies, you think the game relies on lucky rolls of the dice thereafter. Yet, even more so than backgammon, the game actually requires a great deal of skill. The first time you play against one or more experienced Stone Age players, you’ll get wiped out. I have yet to come across a game where skill is so consistently underestimated as Stone Age. Kids learn a ton when they play this, more than most other family games. At a simple level they get lots of division practice as they frequently divide double digit numbers by 2, 3, 4, 5, or 6 when rolling dice for resources. More importantly, they learn about labor and resource management in a context that feels real. This is one of the longer games on the list, typically taking our family of 3 about 90 minutes to play, though only 60-70 minutes for a 2 player game. The limit is 4 players unless you buy the expansion. The minimum age for this game is going to be when your kid is getting into division, which will typically be around the age of 9 or 10. This game has a lot of character, is very engaging, and has a lot more strategy than you’d expect for a game with so many dice rolls. This makes it a fun game for families, including ours. Ticket to Ride is a train route-building game. Players collect sets of identical train cards and then spend them to place routes on a shared map. Longer routes earn more, and bonuses are collected for completing destination tickets that connect distant cities. The tension of the game comes from decisions about whether to take time to amass cards for lengthy routes, or quickly claim shorter routes to earn certain, but lower scores while potentially blocking other players. There are many interesting decisions and opportunities to exercise skill throughout the game, though luck also plays a part due to randomly drawn train cards and destination tickets. This game is widely perceived among game-lovers as the quintessential “gateway” game that gets people interested in board games as a hobby. But it also makes for an enjoyable game for the typical family. Most people get satisfaction from games that establish routes, and this one does it in a way that isn’t too complicated or time consuming. And, like the other 4 games on this list, it can be played simply, or with quite a bit of strategy. Ticket to Ride can easily be played with 8 year olds, and going as young as 6 is not out of the question. This game works quite well for 2-5 players. However, with 5 players, some players won’t much enjoy the long wait between each of their turns. Also, tactics and strategy matter less in 5 player games, as the exposed train cards change too much between each of your turns. Our family enjoyed the first 20 or so plays of this game but we haven’t played it much since. The strategies and techniques for winning get a little stale with the same map. However, the game has many expansions available with different maps and various additional rules to handle other types of terrain such as tunnels, mountains, or large bodies of water. If some family members like the game at first but eventually become bored, consider buying an expansion to keep it fresh. Though we don’t own the Europe map, many players feel that Ticket to Ride Europe is the best game to own of the Ticket to Ride series. I didn’t just put my favorite 5 games on the list. I’ve thought about games for years and have pored through many reviews. In fact, only one of the 5 games above (Catan) is among my favorite 10 games I’ve ever played. I picked them because they are the most suitable for typical families, based partly on what I’ve directly observed and partly on what I’ve learned from extensive reading. Very nice abstract geometric strategy game for 4 players that also works reasonably for 2 players. Though there is a way to play with 3 players, it isn’t very good. That lack of flexibility makes it less suitable for families than some other games, but it’s still a great game that stretches your spatial abilities. Most gamers listing great family strategy games include this one, but not me. It’s a good game in many ways, as players strategically connect beautiful tiles together to complete cities, roads, chapels, and farms. However, it can be played with a cut-throat style. Players who think they are doing well can have the rug pulled out from under them, either by stranding meeples on buildings that can’t possibly be completed, or stranding farmers who were supposed to earn a lot but end up scoring nothing. For this reason, my wife doesn’t have fun with this, and refuses to play. If everyone in your family enjoys cut throat tactics, or nobody in your family would ever use such tactics, than this game may work out much better for your family than it did for ours. Very similar game to Stone Age and if you think your family will prefer the medieval fantasy politics theme, then get this game instead of Stone Age. The theme is not nearly as strong, as I feel like I’m moving around small purple cubes, not recruiting Wizards to go on a quest. Yet, this game has its own unique personality despite the fact that it’s a worker placement game just like Stone Age. These two games are based on very similar mechanics that I find quite interesting. I didn’t put either among the top 5 because both games are a bit too long, a bit too hard to learn, and a bit too complicated for the average family. However, the idea of embracing the rise and fall of empires as a core game mechanic is fascinating and educational. Our family owns Vinci and we play it a few times each year. This train game is simpler than Ticket to Ride (a single page of rules), is one of the few family strategy games that work great for 5 or 6 players, and it takes only 30 minutes to play. The reason it didn’t make the top 5 is admittedly lame—I don’t know the game well. We don’t own it and I’ve only played it a couple times. I did enjoy my few plays of this game and it gets good reviews. If I knew this game better, it’s possible that this would have been on the coveted top 5 list instead of Ticket to Ride. This game is unfairly rated very low at boardgamegeek.com. It was a revolutionary game when it came out, and up until the last two decades was clearly among the best family games available, if not the best. Monopoly’s wheeling and dealing winner-takes-all cut-throat capitalism theme is very well executed. This game has a bunch of minor decisions that are easy to make after you’ve played a few times, but it also has some very complex and interesting decisions related to negotiating trades. People who think Monopoly has very little strategy are flat out wrong. There are national Monopoly tournaments where an average player would have very little chance of winning. Takes too long to play, especially when 2 common house rules are employed (money in the middle, and ignoring the auction rules). In a 2-3 hour game, there are typically only several important trading decisions. Part of what makes modern games so great is that they have many important decisions to make per hour, not just 1 or 2. When one player loses, they can no longer participate until the game is over, which might be a very long time. It is sometimes obvious that you will eventually lose, yet it may take 30 or more minutes to play out this slow, grinding death. While true to the capitalist winner-take-all theme, it’s not fun. I felt the need to discuss this at length because Monopoly is very popular. It actually helps highlight why many modern games are so much more interesting and fun to play. This happens to be a favorite of mine, but for the typical family, it requires too much investment of both dollars and time. Though I understand how to keep costs down for Magic the Gathering, it’s still going to be the most expensive game in the house and for those who get truly hooked could lead to thousands of dollars of year if costs are not carefully managed. The time investment is worse than the expense. My son and I play and enjoy this game but my wife doesn’t want to spend time trying to understand dozens of mechanics and thousands of cards. Good for her. Expensive, time consuming, and complicated is not usually going to be a game for the whole family. This game is another favorite of mine that is a really great game for 3-5 players but it’s not for everyone. The play of this game sometimes has many dramatic twists and turns, occasionally so over-the-edge that a specific game is remembered for years. While not nearly as bad as Magic, some people feel overwhelmed by the chaotic feel of the game until (after several dozen games) you get to know all the cards and common interactions. It’s more possible that this could work as a family game than Magic, but it’s still going to be a bit much for at least one person in the family, if not more than one. We are far more into games than the typical family, yet only 2 out of 3 of us are happy to play this game. Everyone who enjoys playing games has their own favorites. In this article, I listed out the games I believe to be the 5 most fun and interesting strategy games for families, regardless of how much I personally like them—I have been an avid gamer since the age of 4, so some of my favorites are not games a typical family would enjoy. I also provided links in the prior section for where to look for other games beyond these, as there are hundreds of truly great family games. It’s a very exciting time in the history of gaming, with so many great games coming out since 1995. You can’t go too far wrong buying 1 or more of the 5 games I suggested for your family to try out. Well, that is, unless you’re afraid of getting hooked into a lifelong hobby of gaming . . .